Burial location: Hermanville War Cemetery, Basse-Normandie, France. Private Murray McNeil McGee was the son of Olive Gregory and Thomas R. McGee of Lot 19 Concession 12. He attended SS#10 in Lakeside and then worked on the home farm. He was called into service August 13, 1943 where he enrolled in the Canadian Active Service Force in London, Ontario. He took his initial training at 12 Canadian Army (Basic) Training Centre at Chatham from September 3 to November 12 and additional training at A29 Canadian Infantry Corps Training Centre at Ipperwash from November 12, 1943 to the end of January 1944. After a short stint of embarkation leave, Private McGee sailed overseas on February 15, 1944. During his trip overseas, he called the sea-sickness he suffered 'the ocean disease'. 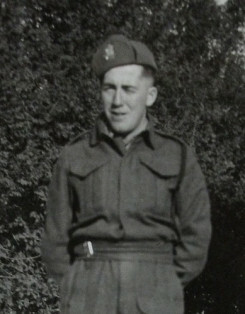 On arrival in England he spent a short period with 3 Canadian Infantry Reinforcement Unit (CIRU) and was then posted to 2 CIRU.Attached to a reinforcement battalion, he reached France on July 6, 1944 and was almost immediately sent forward to A Company of the Canadian Scottish Regiment (Princess Mary's) then serving in the 7th Brigade in 3rd Canadian Infantry Division near Carpiquet. Private McGee arrived at his new battalion just in time for Operation Charnwood in which three infantry divisions (3rd British, 59th British and 3rd Canadian) were to attack on a frontage of eight miles and break through German defences around Caen. The Canadian Scottish role in this operation was to attack through the North Nova Scotia High landers near Authie and capture German positions at the village of Cussy, about two miles from the centre of Caen. Landing in Normandy, the men waded through four feet of water to establish a beach head. There, conditions were terrible. The trenches were so small that breakfast was eaten in bed. The role of the Canadian Scottish Regiment (R.C.I.C. ), was to attack and capture German positions at the village of Cussy, about two miles from Caen, France. Canadian doctrine preached that a "start line" must be secure from enemy fire. Notwithstanding this, the Canadian Scottish were under continual sniper and artillery fire from their assembly area all the way forward to the start line near the Buron-Authie road. The advance was grim: flanking units had not cleared out all of the German positionsthe start line near the Buron-Authie road. The advance was grim: flanking units had not cleared out all thd the German positions. As one historian wrote "Both flanks were still held by the SS and the battle for Cussy became a long, confused action in which everything depended on individual courage and initiative." In the midst of this confusion, Murray was wounded in the upper leg about 2:00 p.m., probably by a machine gun tracer bullet fired at short range. Evacuated to 16 Casualty Clearing Station, he died there at about 5 p.m. July 8, 1944, likely from shock and loss of blood. He is buried at Hermanville War Cemetery in Basse-Normandie, France. He was survived by his parents, his brother David, and sisters Julie McCorquodale of Embro and Dorothy. -- Courtesy of St. Marys Journal Argus.